Frank Gehry’s transformation of the Philadelphia Museum of Art may only be revealed in 2020, but the first elements of Gehry’s master plan have been unveiled in the form of Stir, the museum’s new restaurant that is also the only Gehry-designed fine dining establishment on the American East Coast. 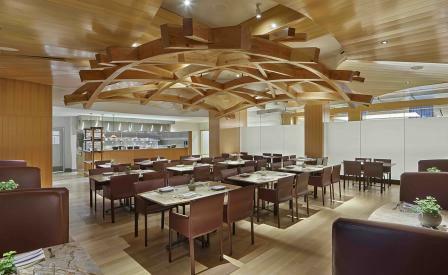 The 76-seat restaurant exudes an intimate and inviting ambience with seating and tables designed by Gehry partners, Douglas Fir clad walls, red oak seating and a dramatically sculpted ceiling feature shaped in Douglas Fir that flows outward above the main dining room, exhibiting Gehry’s fluid stylistic signature. Frosted glass walls lends a clean modernist feel while maintaining a cloistered, intimate atmosphere, while onyx-topped tables and leather upholstered dining chairs and booths add warmth. Stir serves a seasonal menu of elevated comforts made from locally sourced produce by executive chef Mark Tropea. Neighbouring Stir is the museum’s renovated cafeteria, which accommodates 160. Extended to match the width of the museum building, the enlarged cafeteria boasts idyllic views of the East Terrace and its garden on one side, and the Schuykill River and West Philadelphia on the other. An espresso bar is also scheduled to open in early 2019 to accompany the new North Entrance, which makes the museum’s storied Vaulted Walkway accessible to the public once more.